"Lillestrom" redirects here. For the hamlet in Canada, see Lillestrom, Saskatchewan. Lillestrøm is a town located some 18 km (11 mi) east-northeast of Oslo, the capital city of Norway. With a population of some 14,000 inhabitants, it is the administrative centre of Skedsmo Municipality in Akershus County, and lies within the traditional district of Romerike. The name means "the little [part of] Strøm", Strøm being the name of an old and large farm (Old Norse: straumr, which also meant "stream" as well). Lillestrøm's history dates back to the times river powered sawmills came into use for the production of building materials. Later Lillestrøm got its own steam sawmill which laid the base for the development of the area which became the town. The area was, by and large, a moss covered swamp-like area, at the time considered almost uninhabitable. However, the almost non-existent property values were judged to be a fair exchange and so the workers started living and settling in the area around the sawmill, and Lillestrøm was born. On 1 January 1908 Lillestrøm became a municipality of its own, having been split from Skedsmo. At that time Lillestrøm municipality had a population of 4,351. 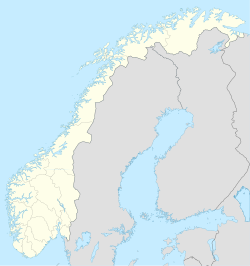 On 1 January 1962 the two municipalities were reunited under the name Skedsmo. Before the merger Lillestrøm municipality had a population of 10,840. In 1997, Skedsmo municipal council declared Lillestrøm to be a town (by) in its own right (a purely honorary status which has no effect upon the organization of local government, but is a matter of local pride nonetheless). The event is commemorated in an annual 4-day street fair, which includes music by high-profile Norwegian artists on several outdoor stages, food stalls, retail business exhibitions, and thrill rides. The whole thing (with free admission to all) is held in Lillestrøm's main thoroughfare and its connecting streets, which are closed to all vehicles for the duration. In 2002, Norway Trade Fairs moved from Skøyen to Lillestrøm. Norwegian national road 159 is a four-lane motorway connecting central Lillestrøm directly to Oslo. The E6 motorway bypasses Lillestrøm a few kilometres to the west on its way from Oslo to the north of the country. National road 22, running from northwest to southeast, passes through the northern outskirts of the conurbation. Lillestrøm is connected to Oslo by two separate railway lines. The Trunk Line (opened 1854) runs to Oslo via the Grorud valley and is used mostly by commuter trains calling at all stations, as well as freight trains. Non-stop commuter trains, airport express trains, and long-distance expresses use the high-speed Gardermoen Line (opened 1999), which runs mostly in tunnel to Oslo. The Trunk Line north of Lillestrøm carries frequent local passenger trains as far as Dal as well as freight trains to Eidsvoll, Lillehammer, and Trondheim. The Gardermoen Line (the stretch of which north of Lillestrøm opened in 1998) is used by airport express trains, regional trains to Eidsvoll and Lillehammer, and long-distance passenger services to Trondheim. Running south-west from Lillestrøm, the Kongsvinger Line (opened 1862) conveys hourly local trains to Kongsvinger as well as a number of longer-distance trains, passenger and freight, to and from Sweden. Kjeller, a village 2 km (1 mi) north of the town, is the site of Kjeller Airfield, founded in 1912, which has the closest operational runway to Oslo city centre. However, this is overshadowed by the much larger international airport at Gardermoen (opened 1998), which is 25 km (16 mi) further north but just 12 minutes away from Lillestrøm railway station by high-speed rail. The head office of Accident Investigation Board Norway is located in Lillestrøm, and is led by Grete Myhre. The University College of Norwegian Correctional Service (Kriminalomsorgens høgskole og utdanningssenter, KRUS) is in Lillestrøm. Facilities in Lillestrøm include hotels, Norway trade fairs, a brand new cinema, a mall, Lillestrøm torv, restaurants, a high speed commuter train that reaches both Oslo and Gardermoen airport (the Gardermoen Line), a community cultural house (kulturhus), and a community outdoor swimming pool complex. At Kjeller, just outside the city, there is a military airport (1912) and several research institutes. The local football team, Lillestrøm SK, plays in the Norwegian Premier League. Their home ground is Åråsen stadion. The nearby Lillestrøm stadion is used for training, and was an ice hockey venue at the 1952 Winter Olympics. There are also two indoor arenas, one multi-purpose (Skedsmohallen) and one for football (LSK-Hallen), and in 2007 a track and field stadium Romerike Friidrettsstadion was built as a cooperation between the municipalities Skedsmo, Rælingen and Lørenskog. The local track and field club is named Minerva. Athletes such as Hanne Haugland and Håkon Särnblom have represented the club. Rugby is represented by newly formed Rugby League club Lillestrøm Lions RLK. ^ Dag Juvkam / Statistics Norway (1999). "Historisk oversikt over endringer i kommune- og fylkesinndelingen" (PDF). ^ "Contact us." Accident Investigation Board Norway. Retrieved on January 13, 2011. "Visiting address: Sophie Radichsvei 17 N-2003 Lillestrøm." ^ "About Us." University College of Norwegian Correctional Service. Retrieved on 16 September 2018. ^ "Jubel for bane uten ball". Romerikes Blad (in Norwegian). 2 September 2007. Retrieved 2008-04-04. This page was last edited on 15 December 2018, at 12:42 (UTC).